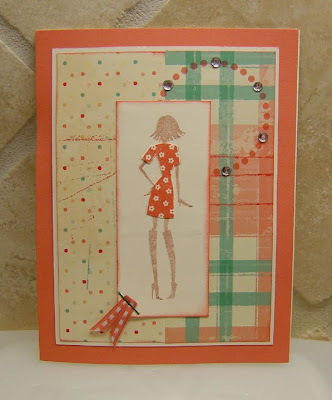 I was playing around with leftovers from one of my card workshops and came up with this. It is basically the same card as in this post. I used this sassy girl image from the Be Yourself stamp set because she fit the paper I had already cut for this card perfectly! I stamped the girl in second generation cocoa ink and then stamped her again in sorbet. I cut out her dress from the sorbet image and placed it over the cocoa image... a technique called paper piecing. Really like this one too. :) The circle element with the Sparkles adds a great touch.